Paid about $100/night for two nights.private room with a shared bathroom. The place was very quiet which was nice. Pretty clean overall (I've stayed in a lot of hostels and this one was average- there were no cockroaches lol) bed was comfortable enough, room was a pretty good size +there was a TV. Staff was helpful and professional. Shared bathroom was surprisingly fine. Location IDEAL (best part).leave backpack @desk for free during day. 11AM check out nice. Would consider staying again. If you are looking for a place to only sleep and shower this is the place. The room and the shared bathroom are both very small. The room to bathroom ratio was pretty skimpy with at least 5+ rooms to one single bathroom. The room was reasonably clean and the bathroom was well cleaned if you could get to it soon after the cleaning person came through. Very convenient location. You get your money's worth at this place, it is appropriately priced for the amenities given its location in Manhattan. 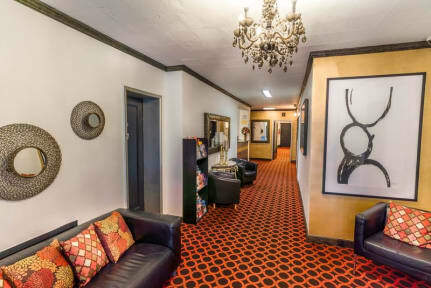 In our search for a reasonably priced place to stay, we came across the Royal Park Hotel. We enjoyed staying there mainly because of the great location - close to the red line it was very easy to get anywhere in Manhattan quickly. We also enjoyed being close to Central Park. Having read reviews, we knew what to expect in terms of rooms, but we were happy with our room as it was spacious and clean! We would recommend it for its location and price. The location is absolutely the good point of the hotel. It just takes 8 minutes walk to the subway system. Nearby there are a lot of restaurants and stores. We feel it is still safe to walk on the street nearby in the evening. 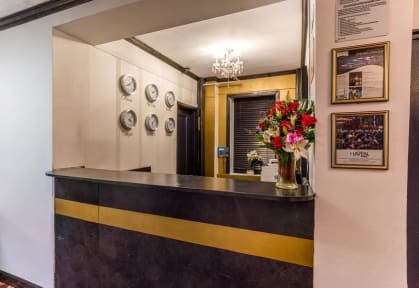 The room is very small and the price is quite expensive, but it is acceptable as it is located in Manhattan district, you can reach different main attractions in a relatively short time by subway. The cleanliness is alright in the room or shared bathroom. Really basic, not many facilities - no kettle or tea or coffee. Towels were small and bed was small for a double. Air con very noisy so you had to have it on whilst you weren’t there and turn it off once in the room. No shampoo or conditioner given just 2 bars of soap and for a double room we only got one glass for us both to use. I booked a single private room and was given a room with bunk beds. It was still private just not ideal. Also 1 bathroom is shared by 10 rooms. I don’t mind the shared bathroom I just imagined the toilet and and shower might be separate but if someone was showering and you have to pee you just hold it. The front desk staff was all very friendly and the location was really convenient. Lift broken for most of my visit. No notice was up on any floor except ground floor so people queued for lift on their room floors had no idea. Staff couldn't be bothered to walk up the stairs and place notice on other floors. My older mother really struggled all visit to walk up and down the 6 stories to her room and we were not allowed to move rooms. Was quite the experience bringing our cases up and down the many stairs. Clean, well located, good value for money but you get what you pay for. There were bloodstains on the bed sheets. I absolutely hated using the restrooms here. It was dingy, pretty dysfunctional and usually occupied. There was one shower and toilet for probably 8 rooms. You could probably have a better location and similar price if you just stayed in a hotel with someone. The rates should’ve really been lower for what this was. The window had chicken wire on it in place of a screen and the building was always weirdly hot at probably 80 degrees (we were there in March).